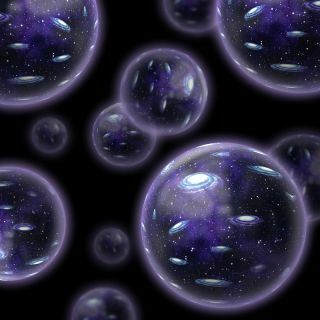 The problem with string theory, according to some physicists, is that it makes too many universes. It predicts not one but some 10500 versions of spacetime, each with their own laws of physics. But with so many universes on the table, how can the theory explain why ours has the features it does? Now some theorists suggest most—if not all—of those universes are actually forbidden, at least if we want them to have stable dark energy, the supposed force accelerating the expansion of the cosmos. To some, eliminating so many possible universes is not a drawback but a major step forward for string theory, offering new hope of making testable predictions. But others say the multiverse is here to stay, and the proposed problem with all those universes is not a problem at all. The debate was a hot topic at the end of June in Japan, where string theorists convened for the conference Strings 2018. "This is really something new and it's led to a controversy within the field," says Ulf Danielsson, a physicist at Uppsala University in Sweden. The conversation centers on a pair of papers posted on the preprint server arXiv last month taking aim at the so-called “landscape” of string theory—the incomprehensible number of potential universes that result from the many different solutions to string theory's equations that produce the ingredients of our own cosmos, including dark energy. But the vast majority of the solutions found so far are mathematically inconsistent, the papers contend, putting them not in the landscape but in the so-called "swampland" of universes that cannot actually exist. Scientists have known many solutions must fall in this swampland for years, but the idea that most, or maybe all, of the landscape solutions might live there would be a major change. In fact, it may be theoretically impossible to find a valid solution to string theory that includes stable dark energy, says Cumrun Vafa, a Harvard University physicist who led the work on the two papers. String theory is an attempt to describe the whole universe under a single "theory of everything" by adding extra dimensions of spacetime and thinking of particles as miniscule vibrating loops. Many string theorists contend it is still the most promising direction for pursuing Albert Einstein's dream of uniting his general theory of relativity with the conflicting microscopic world of quantum mechanics. Yet the notion of a string theory landscape that predicts not just one universe but many has put some physicists off. "If it's really the landscape, in my view it's death for the theory because it loses all predictive value," says Princeton University physicist Paul Steinhardt, who collaborated on one of the recent papers. "Literally anything is possible." To Steinhardt and others, the newfound problems with dark energy offer string theory a way out. "This picture with a big multiverse could be mathematically wrong," Danielsson says. "Paradoxically this makes things much more interesting because that means string theory is much more predictive than we thought it was." Some string theorists such as Savdeep Sethi of the University of Chicago welcome the reevaluation that is happening now. "I think this is exciting," he says. "I've been a skeptic of the landscape for a long time. I'm really happy to see the paradigm shift away from this belief that we have this proven set of solutions." But not everyone buys the argument that the landscape actually belongs in the swampland—especially the research team that established one of the earliest versions of the landscape in the first place back in 2003, which goes by the acronym KKLT after the scientists' last names. "I think it's very healthy to make these conjectures and check what other things could be going on but I don't see either theoretical or experimental reasons to take such a conjecture very seriously," says KKLT member Shamit Kachru of Stanford University. And Eva Silverstein, a Stanford physicist who also helped build the early landscape models, likewise doubts Vafa and his colleagues' argument. "I think the ingredients KKLT use and the way they put them together is perfectly valid," she says. Juan Maldacena, a theorist at the Institute for Advanced Study, says he also still supports the idea of string theory universes with stable dark energy. And many theorists are perfectly happy with the string theory multiverse. "It is true that if this landscape picture is correct, the bit of the universe we're in compared to the multiverse will be like our solar system within the universe," Kachru says. And that is a good thing, he adds. Johannes Kepler originally sought a fundamental reason for why Earth lies the distance it does from the sun. But now we know the sun is just one of billions of stars in the galaxy, each with its own planets, and the Earth–sun distance is simply a random number rather than a result of some deep mathematical principle. Likewise, if the universe is one of trillions within the multiverse, the particular parameters of our cosmos are similarly random. The fact these numbers seem perfectly fine-tuned to create a habitable universe is a selection effect—humans will of course find themselves in one of the rare corners of the multiverse where it is possible for them to have evolved. If it is true string theory cannot accommodate stable dark energy, that may be a reason to doubt string theory. But to Vafa it is a reason to doubt dark energy—that is, dark energy in its most popular form, called a cosmological constant. The idea originated in 1917 with Einstein and was revived in 1998 when astronomers discovered that not only is spacetime expanding—the rate of that expansion is picking up. The cosmological constant would be a form of energy in the vacuum of space that never changes and counteracts the inward pull of gravity. But it is not the only possible explanation for the accelerating universe. An alternative is "quintessence," a field pervading spacetime that can evolve. "Regardless of whether one can realize a stable dark energy in string theory or not, it turns out that the idea of having dark energy changing over time is actually more natural in string theory," Vafa says. "If this is the case, then one can measure this sliding of dark energy by astrophysical observations currently taking place." So far all astrophysical evidence supports the cosmological constant idea, but there is some wiggle room in the measurements. Upcoming experiments such as Europe's Euclid space telescope, NASA's Wide-Field Infrared Survey Telescope (WFIRST) and the Simons Observatory being built in Chile's desert will look for signs dark energy was stronger or weaker in the past than the present. "The interesting thing is that we're already at a sensitivity level to begin to put pressure on [the cosmological constant theory]." Steinhardt says. "We don't have to wait for new technology to be in the game. We're in the game now." And even skeptics of Vafa's proposal support the idea of considering alternatives to the cosmological constant. "I actually agree that [a changing dark energy field] is a simplifying method for constructing accelerated expansion," Silverstein says. "But I don't think there's any justification for making observational predictions about the dark energy at this point." Quintessence is not the only other option. In the wake of Vafa's papers, Danielsson and colleagues proposed another way of fitting dark energy into string theory. In their vision our universe is the three-dimensional surface of a bubble expanding within a larger-dimensional space. "The physics within this surface can mimic the physics of a cosmological constant," Danielsson says. "This is a different way of realizing dark energy compared to what we've been thinking so far." Ultimately the debate going on in string theory centers on a deep question: What is the point of physics? Should a good theory be able to explain the particular characteristics of the universe around us or is that asking too much? And when a theory conflicts with the way we think our universe works, do we abandon the theory or the things we think we know? String theory is incredibly appealing to many scientists because it is "beautiful"—its equations are satisfying and its proposed explanations elegant. But so far it lacks any experimental evidence supporting it—and even worse, any reasonable prospects for gathering such evidence. Yet even the suggestion string theory may not be able to accommodate the kind of dark energy we see in the cosmos around us does not dissuade some. "String theory is so rich and beautiful and so correct in almost all the things that it's taught us that it's hard to believe that the mistake is in string theory and not in us," Sethi says. But perhaps chasing after beauty is not a good way to find the right theory of the universe. "Mathematics is full of amazing and beautiful things, and most of them do not describe the world," physicist Sabine Hossenfelder of the Frankfurt Institute for Advanced Studies wrote in her recent book, Lost in Math: How Beauty Leads Physics Astray (Basic Books, 2018). Despite the divergence of opinions, physicists are a friendly bunch, and are united by their common goal of understanding the universe. Kachru, one of the founders of the landscape idea, worked with Vafa, the landscape's critic, as his undergraduate advisor—and the two are still friends. "He asked me once if I'd bet my life these [landscape solutions] exist," Kachru says. "My answer was, 'I wouldn't bet my life but I'd bet his!'" Additional reporting by Lee Billings.